throwback thursday | Sophisticated Diva ~ A.K.A. Along came Polly! Glory for Petites may be small in size, but she’s BIG on patriotism! She features subtly-textured red faux leather with utterly stylish abstract blue and white stripes. She’s the perfect accessory for picnics, an outing to the zoo, or wherever your busy weekend takes you. contrasting black stripe accent. End pockets. 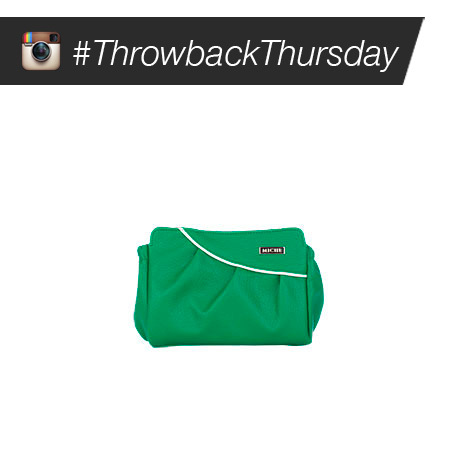 Jude HIP BAG is our Throwback Thursday deal of the day!! $13.95 until 10pm today only–while supplies last!! The bright, rich green color of the Jude Hip Bag is so luscious—it seems to have been plucked right out of a tropical rainforest! And waves of contrasting deep blue piping add even more intrigue. Jude is the perfect take-along for your next adventure deep in the jungle, for that long-awaited European vacation, or just for kicking back with your girlfriends. This bag is completely self-contained—it is not interchangeable like our traditional bags. Features convenient under-flap zippered pocket storage. Long Strap (included) allows for both cross-body and over-the-shoulder toting. Magnetic closure. Dimensions: 5” tall x 7” wide; Strap is ½” wide and 44” long, with a 22” drop. CLICK HERE to be taken there! For those of you still on the fence, the AMERICANA shells are reaching CRITICAL INVENTORY status, and will be retiring very soon!! CLICK HERE to view and order — The demi and prima size of these two fabulous shells are already on the critical list, meaning, they COULD be gone today!